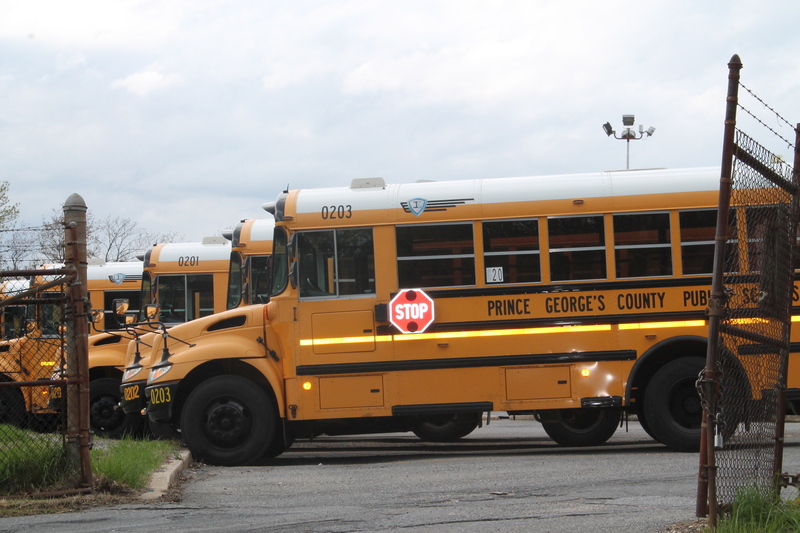 Some Prince George’s County parents have expressed frustration with the inadequacies in the school bus transportation system. Here, seven parents share their stories. My son’s school day ends at 3:40, but he doesn’t arrive at his after-school care facility until some time between 5:35 and 5:55, just a few minutes before I pick him up from after care at 6:00 pm. He doesn’t have time to do his homework during after care, and he is struggling in school as a result. In the morning, he either arrives late to school and misses breakfast; or he eats breakfast when he arrives to school 15-30 minutes late, thus making him 30-45 minutes late to class. My son is bused for his IB+Autism high school, but the afternoon bus a) takes 2+ hours and b) picks up 15 minutes before school ends! Missing a chunk of academics — Algebra, no less — to leave 15 minutes early each day to then sit for 2+ hours on a bus (when it’s a 15-20 minute drive) is unacceptable. We stopped trying to ride the bus after three weeks of frustration. We could never get through on the transportation hotline and all of my emails went unanswered by the transportation office. The bus was scheduled to arrive between 4:26 and 4:46 daily but typically left the school around 4:30 pm and arrived at the bus stop between 5:00 and 5:30 pm. My son started getting frustrated because his bus was so late to school in the morning that he missed the morning announcements and technology class. We simply gave up — no one even tried to address our concerns. We live in Bowie. My daughter attends Eleanor Roosevelt in Greenbelt. The bus is consistently late, causing my daughter to be late to her first period class. The teacher has started waiting about 10 minutes to start class because he knows the buses are notoriously tardy. This takes away from the amount of time that the teacher has for instruction in class. For the students who are unfortunate enough to arrive later than 10 minutes past the start of class, they just miss out. This year I gave the bus for my son’s school a shot early on, but now I have chosen to drive him to his elementary school. The bus this year is not punctual. Maybe it will get better in a few weeks. The Prince George’s County Board of Education held its last meeting of the school year on June 14th and adopted—in a 9 to 4 vote—a $1.93 billion Annual Operating Budget for Fiscal Year 2017. Dissenting votes were cast by Edward Burroughs III, Beverly Anderson, Verjeana Jacobs, and Zabrina Epps. The budget was significantly smaller than the $2 billion that the Board had requested from the County Executive in February. 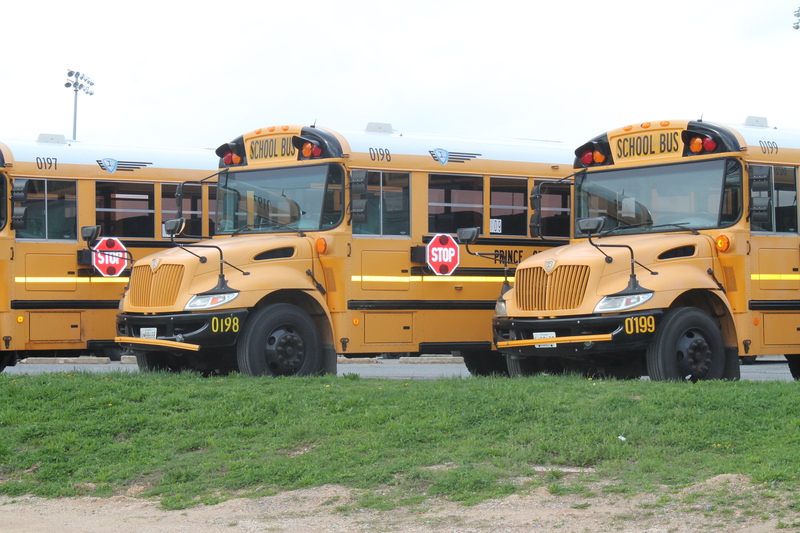 Dozens of cuts were made during the budget reconciliation process, including the $1.27 million proposal to hire 25 additional bus drivers for the 2016-2017 school year. While the issue of bus transportation was by no means the only topic of the evening, it got plenty of attention from parents, students, Board members, and PGCPS employees. Here are some highlights of the transportation-related comments made during the meeting. I was disappointed to see that the additional 25 bus drivers were cut in the reconciliation budget. The ongoing shortage of bus drivers has led to doubled-up routes, significant delays, and even the inability to answer the transportation hotline in the morning, because staff are needed to drive . . . Without the additional drivers, I sincerely hope that the transportation department is spending the summer looking for a more efficient way to get students where they need to be, because what we have now is not working well. Students cannot learn if they cannot get to school. We did some research to find out what was causing the problem of late school buses, and we found two causes: poor pay and poor working conditions [boisterous applause from audience]. . . [Bus drivers] are often disrespected by students on the bus, and students say that they don’t even know their bus drivers’ names. We recommend that all schools include bus drivers in their orientation at the beginning of the year, and the principal introduce the bus drivers to students and review the rules and consequences for riding the bus [more applause from audience]. We recommend that the school board pass a bus driver appreciation day for the district to honor and recognize the work of bus drivers who support our students and their schools. We work very hard every day to transport the children who attend Prince George’s County Public Schools to and from safely. As we approach the end of the year, we are short of help. As you have very well know that we are doubling, tripling runs. We are tired. We’re doing our very best to transport these kids every single day. But as we do so, we have bus attendants also working with us who have been waiting two or more years to become permanent, to have benefits. HR keeps saying, ‘We don’t have the positions.’ They don’t have the money to hire these people. . . And we, as a local, can’t defend a sub-employee . . . But I’m telling you right now, we cannot go into next year doing what we’re doing this year. . . We have meetings on a month-to-month basis, where we come together and try to address all these issues, and nothing is being done. I’m mom of a third grader at Tulip Grove Elementary, and for the past several weeks, we’ve been experiencing inconsistent and unreliable bus pickups in the morning. In particular, because of the doubling up on the routes and the tripling up on the routes, you know, sometimes it will be fifteen to thirty minutes before the children are picked up to go to school. We’ve had occasions when the bus just hasn’t appeared . . . [W]e could use some communication in some way shape or form, some kind of system in place that could notify parents of an issue, if a bus is going to be late, if a bus is not going to arrive. I’m thinking something similar to bus ETA, like what WMATA uses, something like that. Where we can have warning of notice of a late arrival time . . .If we know, as parent, what’s happening, what to expect, we can make other plans to get our children to school and to get ourselves to work on time. . . I would really urge you to reconsider the staffing levels for bus drivers, because we need to get these kids to school, rather than leave them standing out on the corner for 30 minutes in the morning. It’s really disheartening that our employees, bus drivers included, have gone years without adequate funding in the budget, and every year we expect them to just accept that we don’t have money, and it’s just not acceptable . . . A lot of people in my district [District 5], let’s just be clear, love lacrosse. And I do too. But not at the expense of bus drivers who have to get our kids safe here every day, and not at the expense of class size, math specialists, and reading specialists. A seven-year-old student riding the bus was dropped off four miles from his home on Tuesday, according to his mother. This is just one of several troubling bus transportation incidents involving Prince George’s County students during the first week of school (NBC4 and WTOP). PGCPS later apologized for the error and released a video statement addressing concerns (NBC4). The Maryland State Education Association has begun a campaign called, “Less Testing, More Learning” (MSEA). An MSEA-sponsored forum addressed concerns about the overuse of standardized testing in Maryland schools (Maryland Reporter). 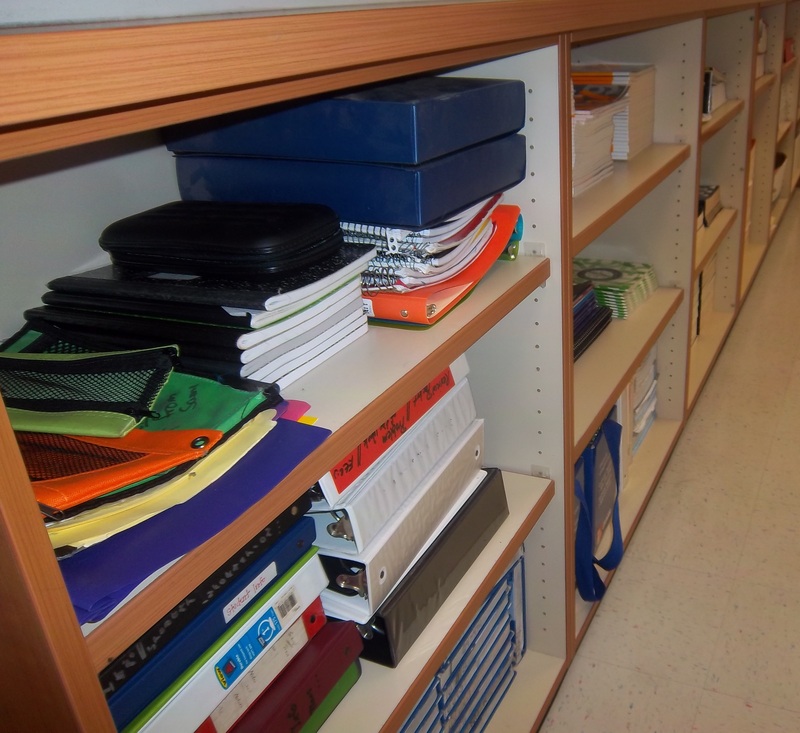 Ten Prince George’s County parents have shared with us something that a teacher, principal, or other staff member did to make the first day or week of school successful. My son’s teacher sent home a letter on the first day of school introducing herself and briefly telling us what to expect in the coming school year. The letter was full of warmth and enthusiasm, and I immediately felt that she was drawing me in as a participant in the class. I was very happy our school organized a back-to-school event before the school year started. It is a great way to take care of some practical issues and ask questions before the often chaotic first day of school. I feel like everyone is more prepared for the year from day one. My son attends a school for kids with severe disabilities that is very far from our neighborhood school. One of the children on his bus has a very hard time on the bus. The second day of the trip, I noticed the aide on his bus had brought a soft blanket with her to help the other girl feel more comfortable when she got on the bus. How sweet is that? It’s so nice to walk into school in the morning and see all of the teachers at their classroom doors, smiling and greeting students! We appreciate the warm welcome. My son’s second grade teacher put together a binder with tabs to keep all paperwork organized. It’s very straight forward. We also signed up for text messages from the teacher. My kindergartener’s buses have been astonishingly late during this first week of school. We drove him to Robert Goddard the first morning (Tuesday), but he rode the school bus home that afternoon. His bus was scheduled to arrive at the stop at 4:27, and it actually arrived at 5:15. His school day had officially ended at 3:55, one hour and 20 minutes before he arrived home. When the bus had not appeared at 5:05, I called the school and was told that it had only arrived at the school to pick up students 10 minutes earlier. That leaves the school scrambling to provide supervision for students for an indefinite period. The second day (Wednesday), we arrived at the bus stop with ten minutes to spare (as PGCPS requests) before the scheduled pick up time of 8:39. The bus finally arrived to pick up my son at 9:30, a full 15 minutes after the school day is scheduled to begin. Both mornings I tried calling the transportation department’s phone bank, as suggested on bus route letters to parents and on the PGCPS website. Wednesday morning, I called at 9:10 and waited on hold until the bus arrived at 9:30. I tried again at 11:30 am on Thursday, once it seemed reasonable to assume that all students had made it to school. After 20 minutes on hold, I finally got through. The gentleman who answered was polite and efficient, and looked up the bus lot supervisor in charge of my son’s routes. He gave me a name and phone number and let me know that the lot supervisor is responsible for both the drivers and buses and is the person to call about both specific issues with buses and lost items left on school buses. Prince George’s County schools have an official administrative procedure on nearly everything — from employee use of social media, to homecoming bonfires, to controlling head lice — and you can find them all at the Office of General Counsel’s web page. More than one hundred Administrative Procedures (each is usually at least two pages long) are detailed on the website, as well as dozens of separate Board Policies that tend to be shorter and deal with governing principles rather than procedural minutiae.